Tax evasion is a complex phenomenon which is influenced not just by economic motives but by psychological factors as well. Economic-psychological research focuses on individual and social representations of taxation as well as decision-making. 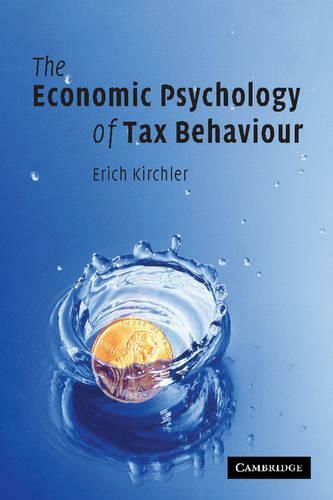 In this 2007 book, Erich Kirchler assembles research on tax compliance, with a focus on tax evasion, and integrates the findings into a model based on the interaction climate between tax authorities and taxpayers. The interaction climate is defined by citizens' trust in authorities and the power of authorities to control taxpayers effectively; depending on trust and power, either voluntary compliance, enforced compliance or no compliance are likely outcomes. Featuring chapters on the social representations of taxation, decision-making and self-employed income tax behaviour, this book will appeal to researchers in economic psychology, behavioural economics and public administration.